Don’t miss our final Harvest Dinner of the season as we showcase a unique menu celebrating the abundance of foods and flavours growing in our organic garden. THE BRASSERIE — This is your last chance to sit at our long family-style table for a four-course feast in the 2017/2018 harvest season. Savour the foods of this prosperous Cayman harvest season, watch our Brasserie Bees make honey and tour the organic garden with our Head Gardener, Aide, as you sip on a refreshing cocktail. Email or call 945-1815 to book and join us to celebrate 20 years of The Brasserie in operation. THE BRASSERIE — Drink up Austria’s rich wine history! Did you know that Vienna is the only capital city in the world to produce significant quantities of wine within its city limits? Home to over 1,700 acres of vineyards and 320 vintners, the Viennese love their wine and we’re confident that you’ll love their wine too! Join us for our next wine tasting with delicious canapés. Tickets are CI$30. Email or call 945 1815. THE BRASSERIE — Come and celebrate St Patrick’s Day the Irish way with our famous corned beef and cabbage sandwiches at the Brasserie Restaurant and Market, washed down with our $3 Brasserie Purveyors’ Guinness specials at The Brasserie. From 5pm also join us at the Wicket Bar where the $3 Guinness will continue to flow in addition to $3 draft beers. While the beer may not be green, our Irish-themed treats at the Market certainly will be! WICKET BAR — Enjoy our $5 Juiced @ The Wicket special each week using local seasonal ingredients in our nourishing, nutritious, energising and refreshing concoctions that will make you and your wallet feel good. Our specials don’t often feature on the regular Juiced @ menu, so make the most of this sweet opportunity. Call 927 6419 to order ahead. CRICKET SQUARE — More car parking is on its way! We have purchased property adjacent to Willow House that will assist with easing the shortage of visitor parking. Temporary unsurfaced parking will be available in the coming weeks and later this year we can open up this property to provide surfaced parking for approximately 40 spaces. This will be used for visitors and to assist with car parking logistics as we progress with the construction of SIX, Caboose and the Club. GRAND CAYMAN & CAYMAN BRAC — One of the most exciting fishing tournaments on the Cayman calendar, the Challenge began with the aim of finding out more about the swordfish population in the local waters. Follow us for two days of fishing, Friday 2 March & Saturday 3 March 2018. There is CI$20,000 in cash prizes to be won! To register, join us at 6:30pm on Thursday 1 March at The Barcadere (Weigh/Dock Station). Click here for more information. ENERGY — Who’s pumped? For the months of March and April, ENERGY is offering an unlimited class pass option for just $350 per person, all inclusive. For the entire eight weeks, you will be able to attend as many Group Pilates, Barre, Yoga, TRX, Core Cardio Circuit, ENERGY X-Training and ENERGY Lunch Express Classes as you like. Enjoy two months of exclusive studio access, classes, wellness gifts and more. Sign up today. WICKET BAR — Who’s ready to fiesta! Grab your sombrero and maracas as Mexico’s favourite day to party is drawing near. 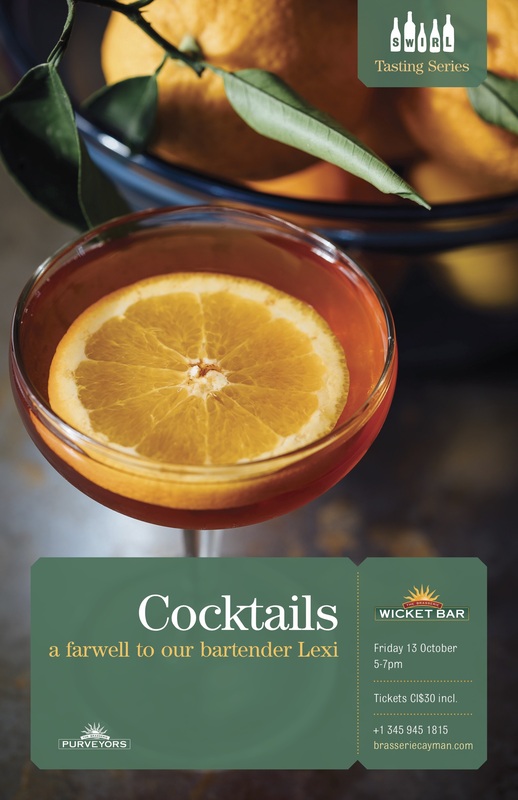 Join us at the Wicket Bar on Friday 4 May as we celebrate with tasty soft shell tacos, locally-inspired margaritas, Brasserie Purveyors’craft beers, piñatas full of goodies, and festive music. Entry is free, just purchase food and beverage tickets at The Market or at the gate on the day. Cricket Square’s event season is about to kick off with new vigour as we reveal a revamped schedule to suit everyone’s tastes. Fire up your taste buds! CABOOSE — The walls to the Caboose are going up! Irma affected some of our shipments for the Caboose so we are now scheduling to open in the early New Year, with testing and commissioning of the kitchen equipment before Christmas. The smoker is on its way and you will be able to enjoy delicious food from the Grab & Go menu soon! THE BRASSERIE — We’re having a cocktail party and everyone is invited! Join us from 5-7pm to bid farewell to our talented mixologist Lexi, as we welcome Roy who will be taking over the cocktail creations at The Brasserie Restaurant. Tickets are CI$30 and include 4 seasonal cocktails made with Brasserie Purveyors’ spirits and paired with delicious canapés. Email Jessica to book or call 945-1815. THE BRASSERIE — Celebrate Canadian Thanksgiving with us during a special Monday’s Secret Pleasure. Enjoy a three-course traditional feast of roasted mushroom bisque, organic turkey roulade and local pumpkin tart accompanied by a sommelier-selected bottle of wine. Book your table here or call 945-1815. Tickets are CI$89 per couple plus grats. Also pop by the Market for your Canadian Thanksgiving favourites. THE BRASSERIE — Who’s getting ready to trick-or-treat? Join us at the Restaurant to judge the best carved pumpkin while sipping on our Halloween-themse cocktails during Happy Hour. Also enjoy a coffin break with Chef Christine’s Halloween sugar cookies, peanut butter cups and Halloween cupcakes available from Friday 27 – Tuesday 31 October at the Market. Happy haunting! 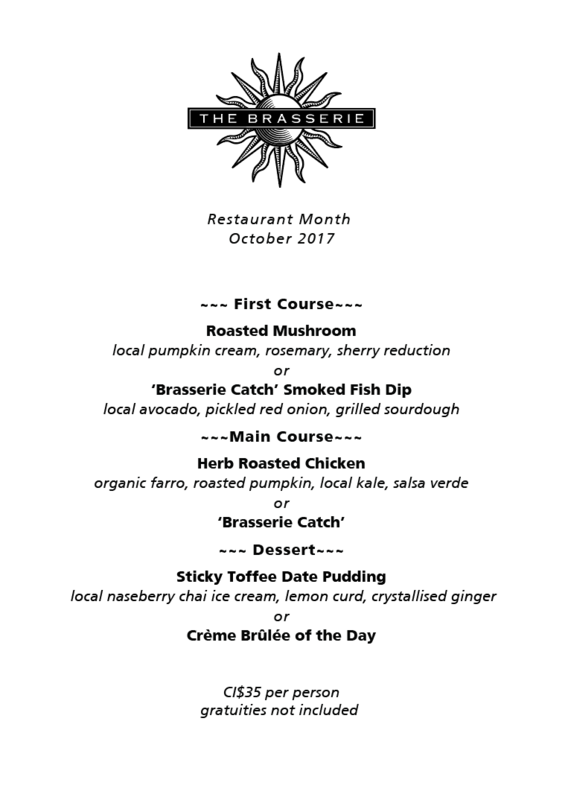 THE BRASSERIE — We are excited to be a part of Restaurant Month for another year. Throughout October, our talented chefs will bring you a special menu of roasted mushrooms, smoked fish dip with local avocado, Brasserie Catch, herb roasted chicken and our famous desserts of creme brûlée and sticky toffee date pudding. Sound delicious? Book your table now and enjoy our three-course menu for just CI$35 per person. WICKET BAR — Have you noticed our new Juiced @ The Wicket signage gracing the Wicket Bar at Cricket Square? Bright, colourful and fun, we have talented and inspirational local Cayman artist Kara Julian to thank. She can bring any space to life with her artistic flair and injection of colour. With new Wicket Bar menu boards also on the way, read our latest blog here as we take a peek behind the scenes. ENERGY — Join ENERGY from 9am for a Pilates workout at The ARC at Camana Bay for the 11th annual Pilates for Pink, complete with Chef Christine’s vanilla and guava cupcakes. Help to raise much needed funds for the Cayman Islands Cancer Society to help provide financial assistance to patients and their families. Register now at ENERGY(CI$30) for a chance to win great prizes including an Apple TV, classes, or a pink BOSU ball! Also receive a Juiced @ The Wicket loyalty card. THE BRASSERIE — Join us for our first harvest dinner of the season off island on Saturday 18 November! We’re heading to the Brac to cook up a storm with lots of local produce. Hint, if you love cheese then you’re going to love what surprises we have in store. Details are being finalised and we look forward to revealing more information shortly. Stay tuned! The perfect blueberry should be “dusty” in colour, but don’t wash that “dust” off until you’re ready to dig in. Rinsing softens blueberries, quickly spoiling them. Blueberries bring you the brightest ray of hope for fighting wrinkles thanks to their vitamin C content that works in our bodies as an antioxidant to help prevent damage caused by the sun, pollution and smoke. This fruit, used as a natural food dye, contains a type of flavonoid known as anthocyanin that are responsible for giving foods like blueberries, cranberries, red cabbage and eggplants their iconic deep red, purple and blue hues. Anthocyanins are responsible for more than just the blueberry’s pretty blue colour – they also contribute to the popular fruit’s numerous health benefits. Maintaining a low sodium intake is essential to reducing blood pressure. Blueberries are naturally free of sodium and contain potassium, calcium, and magnesium, all of which have been found to decrease blood pressure naturally. The blueberry’s fibre, potassium, folate, vitamin C, vitamin B6 and phytonutrient content, coupled with its lack of cholesterol, all support heart health. The fibre in blueberries helps lower the total amount of cholesterol in the blood and decrease the risk of heart disease. Vitamin C, vitamin A and various phytonutrients in blueberries function as powerful antioxidants that help protect cells against free radical damage. The antioxidants in this favourite summer treat help to improve brain function and delay age-related decline. Enjoy our fresh fruit salad (pictured above) from the Grab n Go fridge at Juiced @ The Wicket and the Market. Cut the melon into bite-size chunks and combine with the berries for a wholesome breakfast or mid-morning snack.